What is wrong with digital audio, be it computerized or not, has been wrong from go. No matter what the bit rate, no matter what the digital delivery system, you simply cannot “sample” the continuous-time sound of instruments or vocalists, turn it into discrete-time numbers, and then turn those discrete-time numbers back into instruments or vocalists without losing some of the very continuousness of presentation—the dense, constantly renewing, uninterrupted flow of articulations, dynamics, and timbres—that is the very breath of musical life. Yes, I’m aware of all the real advantages of digital audio in dynamic range, greater frequency extension (at least in the bottom octaves), lower noise, higher resolution, etc. over analog. But I positively dare you to listen to any well-recorded piece of music turned into a digital file and played back from a computer via a USB DAC and then listen to the exact same recording on an LP played back via a really good turntable, tonearm, cartridge, and phonostage and tell me, with a straight face, that the digital recording sounds more like the real thing than the analog one. It doesn’t—even when the LP is mastered from a digital file! Before you start throwing rocks at me—and I expect to get pelted good and proper—let me point some things out. First, many of you have not heard a really great analog rig. I have. Until you do, don’t jump to the conclusion that because it’s a near-seventy-year-old technology LP playback has stood still. While digital audio has continued to try to turn beef tartare back into beefsteak, analog has reached a peak of transparency that is astonishing. Today, we hear so much more of what was actually pressed into the grooves—and do remember that what was pressed into those grooves are the actual soundwaves that struck the microphone’s diaphragm, not a sample of those waves but the waves themselves—that it is difficult to find a recording that doesn’t reveal an abundance of previously hidden treasures. Second, many of you are not concertgoers. Unless you have experience with the sound of the real thing, I’m not at all sure how you can objectively judge a facsimile. “Sounds good to me” listeners will not be troubled by this, and if they’re happy with digital playback I’m happy for them. But those of us who know the sound of actual instruments in a concert or recital hall cannot help but note the artificiality of digital playback—its persistent inability to capture fully the dynamic, harmonic, dimensional, and ambient liveliness of instruments and vocalists. Digital is to analog as a butterfly pinned and pressed under glass is to a butterfly in an open field. In some fundamental and unmistakable way it is fixed, inert, inanimate. In spite of its undeniable dynamic clout, its low noise, its excellent bass extension, its plethora of detail, it also often sounds a bit mechanized, denatured, put together from parts. And nowhere is digital’s fundamental nature more apparent than through a computer-audio pipeline. That extract is from a guest editorial titled The Emperor's New Server by Jonathan Valin in the Absolute Sound magazine. Endorsement of analogue's sonic benefits is coming from the most unlikely places. Overlooked in all the anti-Barbican brouhaha is the recent release by Simon Rattle and the Berlin Philharmonic of a new recording of the Brahms symphonies made direct-to-disc entirely in the analogue domain. This laudable project is the recorded media equivalent of the Elbphilharmonie with a price tag to match - £495 for six LPs. The analogue versus digital argument is well-rehearsed and it is not my intention to re-open it with this post. My point is that many will reject Jonathan Valin's acclamation of high-end analogue sound as just more bad science. Yet it is highly likely the selfsame people will enthusiastically support proposals for a new £278 million London concert hall that promises to deliver the same incremental benefits of increased dynamic range, greater frequency extension, higher resolution etc etc. That is a state-of-the-art £6000 SME Model 15 turntable in the photo; one person's SME turntable is another person's Elbphilharmonie. 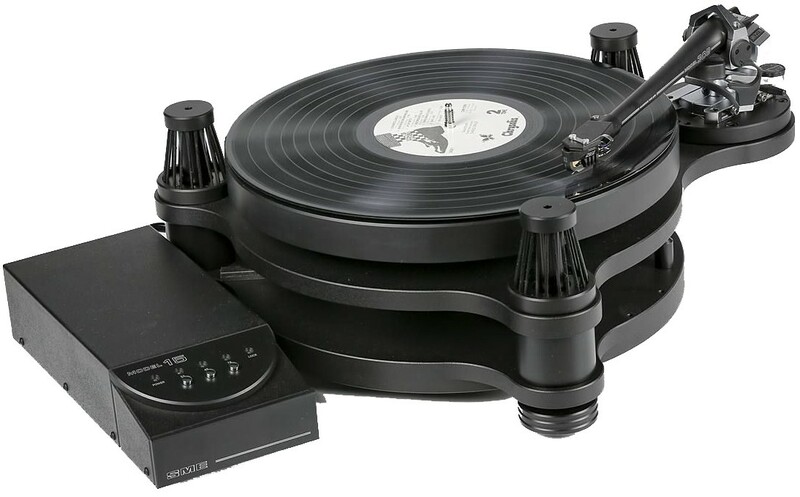 Whilst I have some sympathy with Mr Valin, having once been the proud (and broke) owner of a Linn LP12/Naim analogue system, I long ago gave up on LP's, especially as my tastes gravitated towards "notated" music in my thirties. In fact, I gave all my non-classical LP's to a friend a couple of years or so ago and the classical stuff went to Oxfam. Why? Well, the "first generation" of CD buyers in the 1980s and 1990s are now slipping away into twilight and darkness (well, probably) and their heirs are either selling off their CD collections to "Music Magpie" or their ilk are giving them to charity shops. So, what were once £13.99 CD's can often be picked up for a couple of pounds. I happened to be in Abergavenny last week and spent £10 in Oxfam on three Japanese CDs (Chailly Brahms 2/3 with the RCO ans Sawallisch's classic set of the Schumann symphonies - fantastic sound quality - what do the Japanese do?) and a Pentatone SACD of Brahms 4 with Janowski and Mahler/Zemlinsky Lieder with von Otter. These discs were all in first-class condition and sound great to my ears on my modest Denon SACD/CD player, amp and LS3/5A type speakers. It seems dead men (it is always nearly all men who collect classical CDs) looked after their expensive acquisitions 20-30 years ago. My great friend to whom I gave my LPs is as bad as me for trawling charity shops and Amazon sellers, but he still hankers after the "black stuff", crappy, smelly sleeves, scratches and distortion and all - he is happy and so am I. That's all we need to know as far as the LP/CD debate is concerned, surely?